Sunoco® is not a sponsor or co-sponsor of this promotion. Use of this Sunoco Gift Card is subject to terms and conditions printed on the cards. Sunoco Gift Cards are issued and sold by SVM, LP. SUNOCO and logo are registered trademarks of Sunoco, Inc. and its subsidiaries. Sunoco® is not a sponsor or co-sponsor of this promotion. 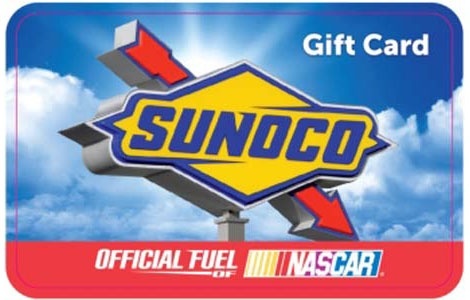 Use of this Sunoco Gift Card is subject to terms and conditions printed on the cards. SUNOCO and logo are registered trademarks of Sunoco, Inc. and its subsidiaries. Use of this card constitutes acceptance of the following terms: The Sunoco Gift Card is redeemable for authorized products and services only at Sunoco Branded facilities. This card is not redeemable for cash or credit, except where required by law. This cash card is not a credit card, debit card, asset account or deposit account. To report a lost, stolen or damaged card, call 1-877-653-3357. Remaining value may be replaced on a lost, stolen or damaged card only if the account number and remaining value on the card can be verified.